These are lyrics by Sammy Kershaw that we think are kind of repetitive. 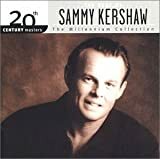 Sammy Kershaw's, "Queen Of My Double Wide Trailer"
Sammy Kershaw's, "She Don't Know She's Beautiful"
though time and time I've told her so. I love Sammy Kershaw and the song kinda hits a spot in me beacuse I have such low self esteem but know one understands why because they say I am beautiful. So I listen to the song when I here it but this part makes me feel like picking up the needle on a record cuz it's skipping. Drives me nuts!